A temporary World War I commemorative exhibit titled, “The War Illustrated: Scenes from the Great War,” will be exhibited aboard Battleship March 1, 2018 to December 1, 2018. 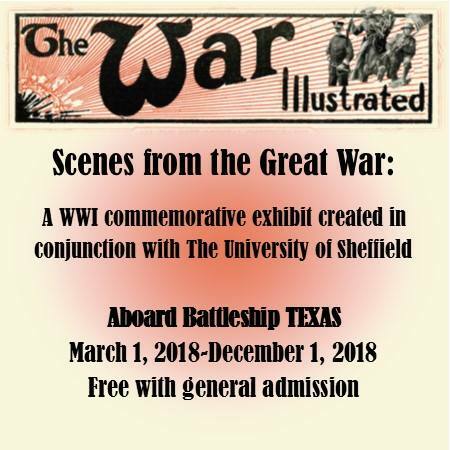 This exhibit, created in collaboration with the University of Sheffield, tells the story of America’s entry into World War I, and the crucial involvement of the U.S. Navy as told in the pages of a British magazine, The War Illustrated. This exhibit is free with general admission to the ship. More information about the exhibit and Battleship Texas State Historic Site can be obtained by calling (281) 479-2431 or by messaging the site.